We’d love your help. Let us know what’s wrong with this preview of Just Me, Wrigley by Savy Leiser. Wrigley loves to dance! She can shake her tail all over the animal shelter. But for some people, Wrigley's rhythm isn't enough. Can Wrigley find the confidence to accept her mixed-breed identity and dan Wrigley loves to dance! She can shake her tail all over the animal shelter. But for some people, Wrigley's rhythm isn't enough. To ask other readers questions about Just Me, Wrigley, please sign up. First, I want to say the cover to this one is super cute and super fun! No, I don’t have a dog, but it kind of makes me want one! Especially if it dances! What I like best about this series, is it’s a great learning tool for kids about dogs that don’t necessarily come from the best of places. Sometimes they don’t have a great first home, so then once they are at a shelter, it doesn’t end there. There’s that possibility of having a new home that could provide them and the owner’s joy. Wrigley was c First, I want to say the cover to this one is super cute and super fun! No, I don’t have a dog, but it kind of makes me want one! Especially if it dances! One day, Wrigley's dreams come true. She becomes a surprise Christmas present for a young boy. Instead of being Just Me, Wrigley, the third installment in the Furever Home Friends series by Savy Leiser, follows one special pooch on her quest for a forever home. Wrigley is starting to notice that she's different from the other dogs. One day, Wrigley's dreams come true. She becomes a surprise Christmas present for a young boy. Instead of being delighted, the boy is disappointed. He doesn't care for Wrigley's dancing and was hoping for a Dalmatian. A sad and confused Wrigley is returned to the shelter. She tries to be more like the other dogs, but nothing seems to work. Her paws are too big to be dainty. Her coordination is too poor to make her a star athlete. Will Wrigley ever find a family that loves her just the way she is? I love this book! The story is filled with humor and heart. I fell in love with Wrigley from page one and rooted for her throughout. Being a pet parent to five rescue dogs, I can definitely relate to the breed prejudice that many shelter dogs are subjected to. Instead of viewing each dog as an individual and seeing if his/her personality is a good match, many people are more concerned about designer breeds, coat colors, and whether or not the pup is already trained. Several of my dogs were returned to the shelter for "behavioral issues" that my husband and I have yet to see. It is truly heartbreaking knowing that so many wonderful animals are treated like disposable objects. The illustrations are whimsical and fun. Leiser uses a combination of hand drawn images with mixed media pieces to create truly stunning artwork. Every turn of the page is a surprise that is sure to delight readers. 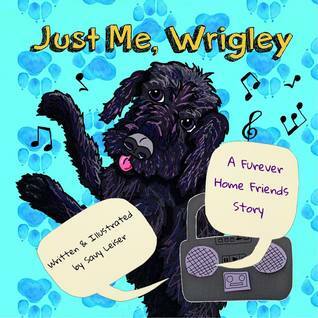 Just Me, Wrigley is the third book in the Furever Home Friends Series. I’ve had the privilege of being able to read and review them all. As a dog lover, owner, trainer and rescue advocate I absolutely love what Savy does with these dogs, and their stories! Not to mention, I adore how she uses these dog’s stories to teach children valuable lessons! It’s done beautifully! These books can be used for parents to read and discuss the questions at the end to get their children to open up about some ve Just Me, Wrigley is the third book in the Furever Home Friends Series. I’ve had the privilege of being able to read and review them all. As a dog lover, owner, trainer and rescue advocate I absolutely love what Savy does with these dogs, and their stories! Not to mention, I adore how she uses these dog’s stories to teach children valuable lessons! It’s done beautifully! These books can be used for parents to read and discuss the questions at the end to get their children to open up about some very important feelings children deal with today. The books could be in the library, a lot of libraries now have a children’s reading time and this would be a wonderful book to read and discuss the questions with the children. My library has a dog that comes to one of the children’s reading hours, once a week. So I’m donating the first two books for that, and I will definitely be adding this one! Now, I HAVE to mention the artwork!!! It was so creative and well done!! It was fun and would definitely entertain those young brains, that are so creative and notice all the detail. I kept noticing certain pictures that I thought would really look nice framed. Savy Leiser did all the art work herself and this is the first book she’s illustrated. She’s a very talented lady. Savy, I’d suggest some of these as prints for sale, or bookmarks....or something!! They’re beautiful!! This is a super cute book, which opens the eyes and hearts to animals, especially those who have landed in the shelter. Wrigley isn't as talented as the other dogs around her at the shelter, but she loves to dance. When she's picked up by a family and presented to their son as a Christmas present, she's sure she's found a new home, but the boy wanted a different dog. Wrigley lands back in the shelter, crushed and unsure of herself. Somehow, she must overcome her self-doubt and maybe find a true h This is a super cute book, which opens the eyes and hearts to animals, especially those who have landed in the shelter. Wrigley isn't as talented as the other dogs around her at the shelter, but she loves to dance. When she's picked up by a family and presented to their son as a Christmas present, she's sure she's found a new home, but the boy wanted a different dog. Wrigley lands back in the shelter, crushed and unsure of herself. Somehow, she must overcome her self-doubt and maybe find a true home. The author does a fantastic job at exposing the tales and bringing sympathy for the various histories dogs can face before landing in the shelter. Wrigley is a sweet dog, whose is hard not to immediately fall in love with. The heart hurts when she lands right back there where she'd hoped to leave—something which reminds people what it means when they place a dog in the shelter. On the other side, Wrigley needs to come to terms with her own self-image—something kids and adults often have a problem with. Her wonderful personality guides readers through this fun and warm journey, making it a lesson to learn without becoming preachy. Plus, dogs are super sweet. The illustrations have a personal touch and invite to be flipped through time and again. They bring Wrigley's personality nicely to life. This is a sweet read, especially as a read aloud, with many wonderful messages and tons of cuteness as well. I LOVE the Furever Home Friends series and was so excited when I heard Just Me, Wrigley was coming out! Wrigley's story is easily relatable for children who may feel like they need to act a certain way to belong, that their unique qualities may not be good enough to be loved. But at the end of the day, we all need to be ourselves, because that's the best version we can be! While teaching a moral, it's adorable and funny! The artwork is so fun, unique, and creative just like Wrigley and is all cr I LOVE the Furever Home Friends series and was so excited when I heard Just Me, Wrigley was coming out! The artwork is so fun, unique, and creative just like Wrigley and is all created by the author herself, which is so impressive! I loved seeing each new page and how it was going to be created! This a book that a child would want to read over and over just for the artwork, but with Wrigley's fun attitude? It could easily become a favorite in the house!